This is our entry way. It was fine but I've been itching to paint the doors black. I'd been resisting this because black doors are de rigueur right now and I try to avoid trends. But then I realized I was being a stupid hipster and it's okay to follow trends sometimes. It's just paint. So I painted the doors here and in the kitchen and I freaking loved them. But then I started looking at the paint job in here and how the previous owner didn't even cover the old orange paint in the area between the front door trim and the coat closet trim. I started to get itchy to repaint the walls. Thanksgiving won't be perfect if I don't repaint the entryway! Greg was like, "Wait, what, you're painting again? I thought you were all done." and I was like, "La la la, MORE PAINT FUMES HOORAY!" I had pinned this image a while back onto my "awesome paint colors" board. It's 'Peaceful Night' by Behr. I went to Home Depot and grabbed a gallon because I was like, "Oh, it will be so awesome I'll want to use it everywhere!" Without testing it first. Do you see where this is going? Uh, that's not the same color. I know, Internet browsers, photography filters, blah blah, I should have tested the color first. Because it's electric cobalt blue. 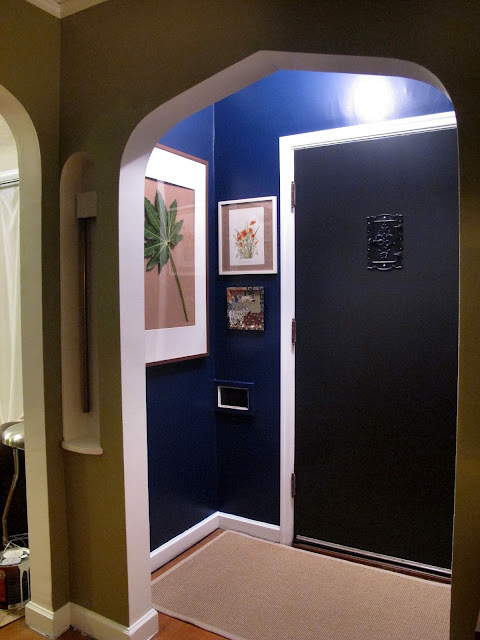 Cobalt blue is having a moment, so our entry way is totally on-trend but it doesn't really fit with the color scheme of the rest of our house. I ran to Ikea and bought the largest natural wood frame I could find and threw a Fatsia japonica leaf in it (think it will last until Thanksgiving?) and tried to break up the blue with some scavenged artwork. No dice, it's still crazy blue. So we're going to have to repaint it. I don't hate the color (as I'm sitting here I'm realizing it's very similar to LeAnn's garage, which looks amazing) but it stands out from the rest of our house. We employ a pretty consistent color value throughout our house and this is off the charts in comparison. If you're in love with this color and want the almost-gallon I have, just let me know. It's all yours. And then I am not allowed back at the Home Depot for at least a month. OMG I LOVE THE DOORS!!!! Those look awesome! Well you know, Frida Kahlo would love it. But you're right. It's not at all the color from your color board. But you know what? I love the doors. LOVE. Why can't things look like they look on the Internet? Why doesn't my garden look like Hayefield? Or yours? Sigh! Thank you! I love the doors too. The upside is that this is a very small room, so I can whip out a new paint job in a day. But why did I buy a gallon without testing first?!? I admit, I might have laughed out loud at the photo of that blue. I apologize. But what a blue!!! And echoing everybody else -- I love those black doors!! The doors look SO GOOD! I love them. 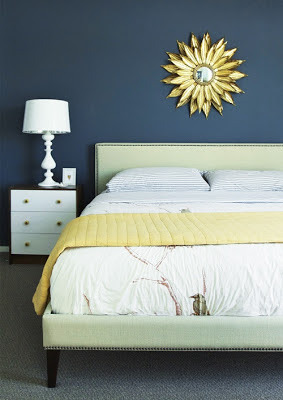 I would have done the same thing you did with the paint - the pic you pinned is gorgeous and I would've just thought, Oh, it'll look different once it's on the walls. Testing is so annoying! But, as you have proved, worth it. I think I'm going to have to break down and get some paint samples for our bathroom because I just cannot decide on what color grey is The Right One. How could you ruin Thanksgiving like this? LOL. I also fucked up the coffee table. Everything is ruined! I can go you one better. I bought a gallon of paint that was supposed to be a tasteful taupe. A friend of my son's was staying with us and wanted to help out, so I left him with the paint can (unopened) and a brush and went off about my business. 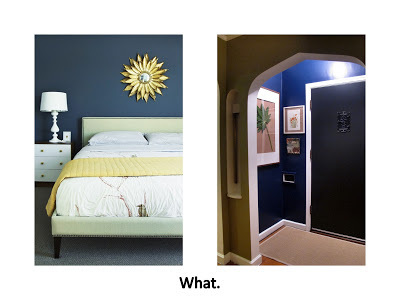 It was quite a shock when I returned to a navy blue wall. I must admit it kind of grew on me. Like everyone else, I love the black doors, but, sorry to say, thought they were just about perfect with the wall color you started with. Um...I have totally done that. Instead I now spend way too much money on sample cans trying to get the perfect color. At least your entry way isn't that big. The color in the photo from your pinboard is lovely. Love the doors - what is the name of the black? From Home Depot also? It's Benjamin Moore's Onyx, which is water based. I got it in the semi-gloss sheen. It's beautiful paint! 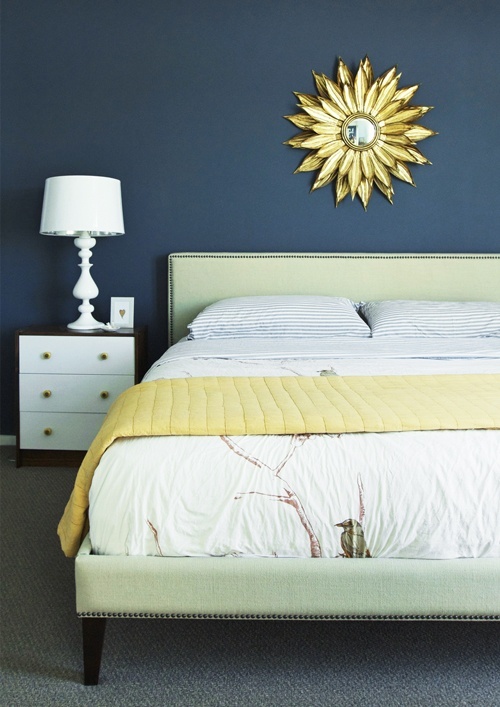 We ran into the same problems with Behr's blue color palette. In the end we went with Distance, which photographed nearly teal in another blogger's house, but is a moody, steel blue in our home. Huh. That's a bummer that you got an off color but I'm glad to hear I'm not the only one this is happening to. The moody, steely blue is actually the color we were going for. Strangely all of the samples I bought first that matched that description showed up more like what you ended up with. I tried Distance on a whim and was pleasantly surprised, but I'm loathe to recommend it to anyone looking for steely blue because elsewhere it's teal. Just catching up on blog reading. Our dining room is "seaworthy" by Sherwin Williams and looks a lot like the inspiration photo. PS, I love the black- especially in the kitchen. Trend, schmend. It looks good. Ooh, I'll have to check that color out. Thanks!